What is a tight building envelope? When a home has a tight envelope, it stays warmer during the winter and cooler during the summer because comfortable air inside doesn’t escape as easily. There are areas of your home that experience energy losses, such as windows, vents, doors, old HVAC systems, recessed lights, and poorly insulated areas. Isn’t it too cloudy? No. The world leader for solar installations is Germany. The darkest place in Oregon, Astoria, receives more sun than the sunniest place in Germany. How much space do solar panels need? Each kilowatt of power requires about 100-square-feet of surface area. The average home needs about 300 to 600 square feet of space. How much will I save going solar? Portland residents find that solar systems pay for themselves in about 4 years in the form of lower energy bills. Of course, this varies by geographic location. How else does solar energy help? Using solar power helps the nation reduce its dependence on foreign sources of energy, like oil. Solar power is also a clean form of energy that doesn’t release pollutants, unlike traditional forms of energy. Plus, installing a solar system may increase the value of your home by up to $5.50 per watt. What types of solar energy are available? Photovoltaic systems are solar panels that use semiconductors to convert the sun’s rays into electricity. The panels generally connect to your utility meter. On the other hand, solar thermal systems use the sun’s energy to heat water or the air in a home. A thermal system doesn’t generate electricity, so it doesn’t need to be connected to your utility meter. Can I install a solar system on my home? 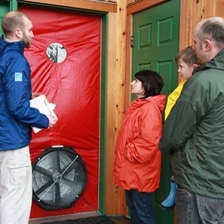 During a home energy audit, a solar energy expert will inspect your home and property. They’ll measure the tree coverage over your home and make sure that your roof is the right type, in good shape, and is less than 15 years old. A solar system can be a great addition to an energy efficient retrofit and can offer a home decades of clean energy. The bottom line is that when you improves your home’s performance, you can easily shave 30% or more off of your utility bills. - Jonathan Cohen is the chief engineer for Imagine Energy, LLC in Portland, Oregon.